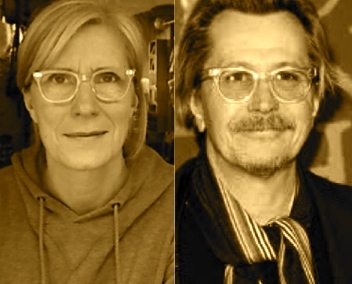 I noticed that Mr Oldman and I have finally decided to let stylistic bygones be bygones, so now let it be know that we have much in common…… and the frames have it! He is the only person I have seen sporting my posh and becks, and I am pleased. I have for a long time had him in my little book of stand-ins, just in case Mr P. did get run over by a bus ( please don’t). I am not sure if us strolling hand in hand, wearing the same glasses would go down well on the red carpet etc. Ah well. We shall cross that bridge when we get to it. Also I am not sure if it is wise to hook up with someone with the same first name initial, as you would be always opening their mail by mistake. 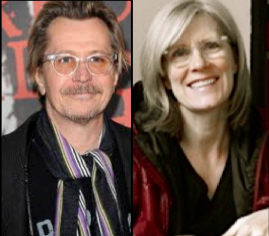 Mr Oldman is married to a song-writer and I am married to an actor (well Mr P. used to be), so something else in common. Right now I can only approve of Mr Oldman’s choice of frames, and leave it at that. Good luck with the Oscar nomination. Back to reality poor lovely Mr P. has had the root taken out of one of his back teeth. It will take 3 months to heal before anything else can be done to it, so soon he is going to be all moody and hollowed out on one side of his face. ha ha. Aaaaaah! I wrote him a little blues song about me working all day long to buy my baby some teeth. It has gone now.